This week I happen to be in knee deep in summer parties. I got home from vacation around midnight on Friday (Saturday?) 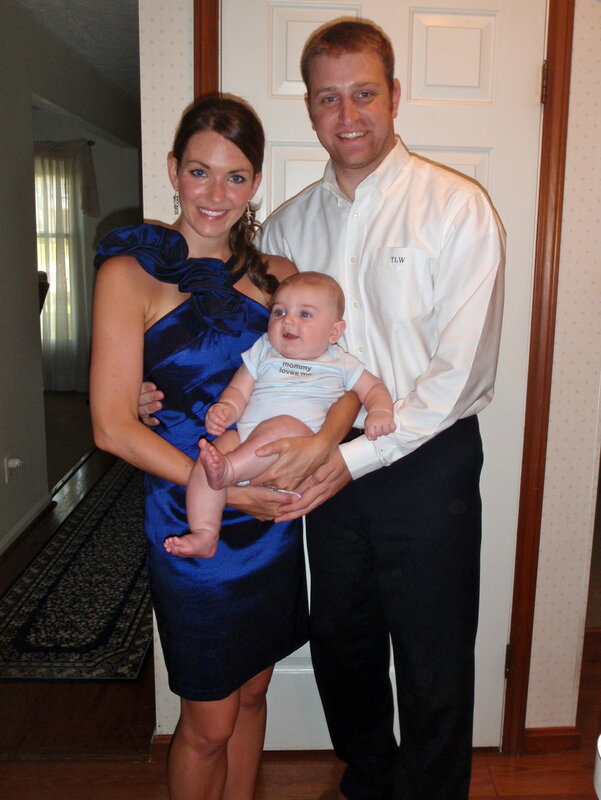 and had a little family/engagement party to host at my home Sunday afternoon. Monday and Tuesday were my first days back at the office after being gone for ten days and Tuesday evening was my annual firework party. I didn’t get to pick the date of any of these events, so I just roll with it and try to keep it simple. There are a few things that keep these parties running smoothly. Nowadays I follow a simple formula: 1) wine/beer; 2) meat (protein); 3) vegetable; and 4) starch. I buy a dessert or ask a guest to bring it. Really, no guest expects any more than this and if you are having a casual party you can totally ask guests to pitch in a bring a dish. For meat recipes I always try to do something that either involves a slow cooker or slow cooking process (i.e. I can leave it on all day and not fuss with it) or that I can cook the day before and just reheat. My philosophy is simple. Hosting a party doesn't mean slaving away in the kitchen. It is supposed to be fun even for the host. It's not 1950, both my husband and I work outside of the home. Relax. Enjoy your guests. Get out the crock pot, pour a glass of wine, and move on with your life. Um, hello? Drinking on the patio? You need these! It is no secret that wine is my drink of choice. The issue I was having is that whenever I have my family over they are teetering around outside with my wine glasses and inevitably a few (or more) are broken. I was strolling through Target one day, hitting up that glorious one dollar section up front, when I noticed some plastic stemless wine glasses. I immediately purchased a few and went back for more. They were awesome! I was having outdoor parties and drinking wine by the fire pit and no one was breaking glasses! These lasted for one entire season until I screwed up and put them in the dishwasher. Here’s a Mom hack for you, don’t shrink your plastic wine glasses in the dishwasher! Fortunatley I found these awesome dishwasher safe glasses at Target. They are perfect for wine and wine related beverages, but also perfect for water on a hot day and even kid friendly. Plus, if your kids can’t break them, your drunk uncle probably won’t either! I also noticed that Target has a new style. Love these! For the morning after you drank on the patio all night. At first, I thought this was kind of weird. I was introduced to it in LA of all places. Soooo LA, right? I was told to take one before bed and it "prevents a hangover." I mean, I am in my mid-thirties so I pretty much get a hangover after more than one glass of wine (aging is no bueno) and waking up with a headache with kids is the actual WORST. Especially in the summer. Having a cup of coffee in the blinding sun with kids begging for Fruit Loops while your head pounds will make you question life decisions in ways you never thought possible. So I was game to try just about anything because I do enjoy wine. So after a night of drinking a little more than I should have (it happens to the best of us) I took one and chugged a LaCroix before bed. I woke up feeling better than I should have. I did not need sunglasses to enjoy coffee in my own kitchen. My head did not pound. Hangover averted! I am not a medical professional and I make no claims about the effectiveness of this for the general public. All I am saying is that it works for me. You can find it here or click the photo below. I should also note that if you go absolutely nuts and are ripping shots like an undergraduate, this probably won't save you. Get yourself an Uber or Lyft and get to Taco Bell because it might be the last thing you enjoy. Any time I am hosting a party or even just a few friends I like to have some tapas and nosh for everyone to snack on while we are chatting. It helps to get a little something in the stomach so those first few drinks don’t ruin the night. Sidebar: I am also the kind of person who could survive on appetizers, tapas, French fries, and drinks alone. Snacking = life. So many gatherings are impromptu or at the end of a busy week or after a child’s activity. Sure, I could run home and prep some fancy appetizers or make something from scratch. But I honestly would rather relax and enjoy my friends and family. Besides, why reinvent the wheel when Trader Joe’s exists! My all time favorite place to get finger food and appetizers it Trader Joe’s. I have sampled SO MANY of their apps and here are a few of my staples in no particular order. I serve these as apps but also as part of a quick meal for my kids. They’re tasty, crispy, and you can dress them up with salsa, sour cream, or guacamole, or just serve them plain. They also come in beef and I love them both! These are my personal favorite and if you have ever been to my house you probably know this because we serve these ALL the time. 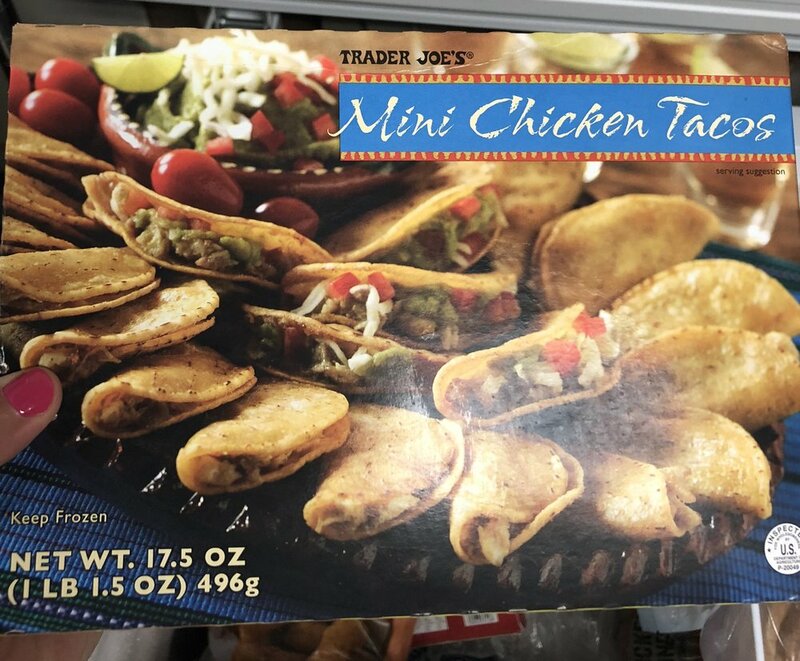 I always have at least four boxes in my freezer and these and my number one all time favorite thing that Trader Joe’s makes. I have never met a person or child who does not love these. They are perfect for any party, any time of year. All you need is some corn chips and you are all set. This just gets microwaved for like three minutes. It’s ridiculously easy. It’s also easy to keep on hand because the box is small. There was a point in time during our marriage when Terry and I had one of these every single Friday night. Now, I usually reserve them for hosting folks. It makes a great compliment to red or white wine. You can cut it in squares or slices depending on how many guest you have. I have hosted, more than once, usually on the fly, the several hour break between a wedding ceremony and wedding reception. These are dangerous (hello, activated charcoal before bed) because folks have not eaten since lunch and likely won’t be eating again until after 8 pm and everyone knows they have a babysitter locked down for the night so they are slinging back drinks and making bad decisions. A couple of these pizzas on hand may keep at least one of the guests sober enough to drive to the wedding reception! These are also great to have during the summer wedding season for when you get home from a wedding. It’s that magical time when your life turns back into a pumpkin as you realize that need to eat before bed to function as a competent parent the next day. These are just a few of the ways that I soldier through the summer party season. It seems like we wait all year for summer to hit so there is no reason to stress when we should be taking a minute to look around and enjoy life. It can be a lot of work to host parties, but the end result is spending quality time with family and friends. I find that it is all worth while. How about you? Any summer party hacks I glossed over? One more thing: don't forget to hydrate. I, like every basic suburban mother, am hooked on La Croix. May you enjoy the following YouTube find in honor of La Croix.